Customer Kathy sent us this picture of her handle. 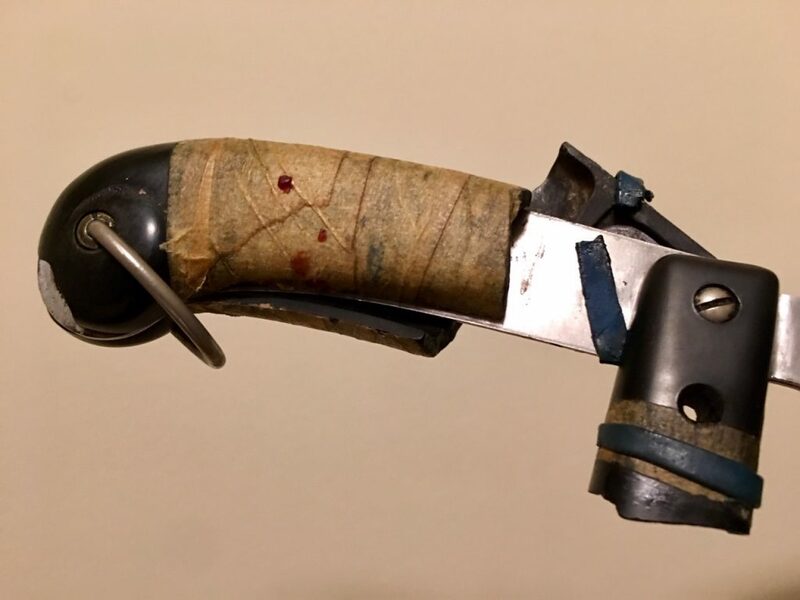 It reminded me of how many people suffer with sub-standard handles because they love their Revere Ware so much, they refused to replace them, despite severely damaged or even missing Bakelite parts. We’ve also gotten reports of people simply grabbing a bare metal spline with a pot holder or using pliers where the handle has come completely off the spline. We’ve been selling parts now for 10 years. Before that, there was about a 25 year period where no replacement parts were available. People had a long time to get used to not being able to get replacement parts. Combined that with the fact that many of the Revere Ware generation are older, and not exactly internet savvy, we’ve probably reached just a fraction of the people that need our parts. Revere Ware was sold from 1939 to 2018, almost 80 years. 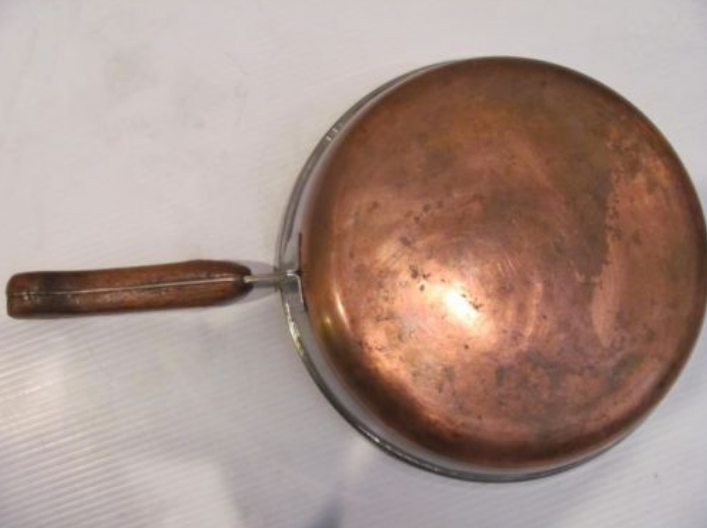 There have likely been 50-100 million people in this country that have used Revere Ware at some point during their lifetimes, and I would guess 10 million or more that continue to use their cookware. In the 10 years we’ve been selling our parts, we’ve sold to 40,000 customers. That means there are many millions of people still diligently using their Revere Ware, many of which are doing so with less than suitable Bakelite and other parts. Please help us reach the people that need our parts. Help someone who doesn’t have access to the internet purchase parts. Tell your friends. If you come across a forum that is discussing Revere Ware and availability of parts, let them know about our parts and all of the information we’ve gathered. We need your help to keep this business going and help it reach the people that need it. When we think of overheating plastic, we think of plastic melting. But Bakelite is a little different. When overheated, it doesn’t melt, but instead breaks down into its constituent parts, one of which (formaldehyde) smells nasty, and isn’t good to inhale. 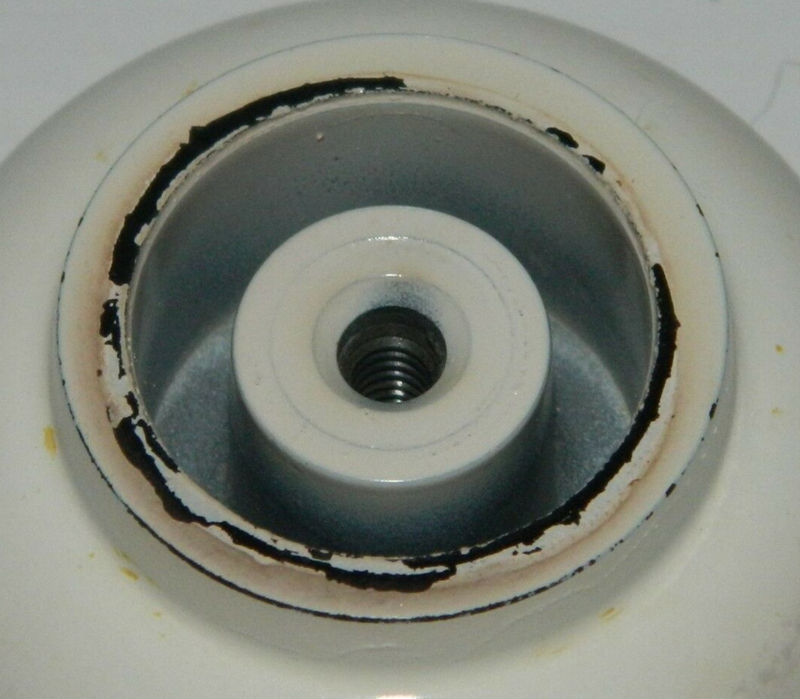 Bakelite is safe to 350 degrees Fahrenheit; putting it in an oven is not a good idea. 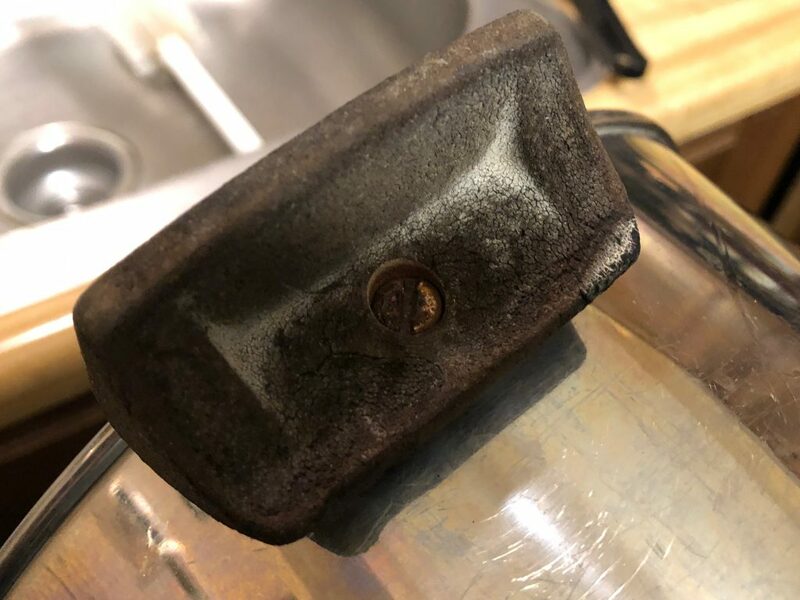 The most common culprit for overheating is a gas stove where the flames are too high, and the lick up the sides of a sauce pan and heat the handles directly. While we always assumed that overheating was the only ways to cause problems, there is at least one anecdotal report that once overheated, Bakelite may be sensitive to overheating at a lower temperature. After many years steady use, I’m getting toxic fumes when I use them on anything but very low heat. It smells exactly like burnt plastic and the fumes seem unhealthful, not just smelly. I’m assuming it’s the handles, but they don’t seem degraded more than normal for their age. I do have a gas stove and tried lowering the flame, since the flames can lick around the edge of the pan and up toward the handles. But I am still getting the fumes strongly, even when the handles are very warm at all. 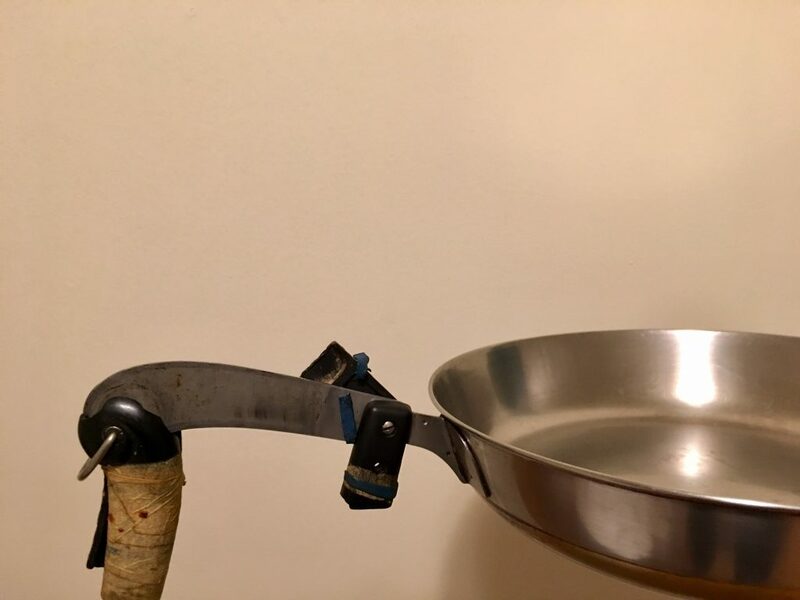 If you have the same issue, or if your handles have previously been overheated and seem sensitive to even lower heat, it is probably safest to replace your handles. 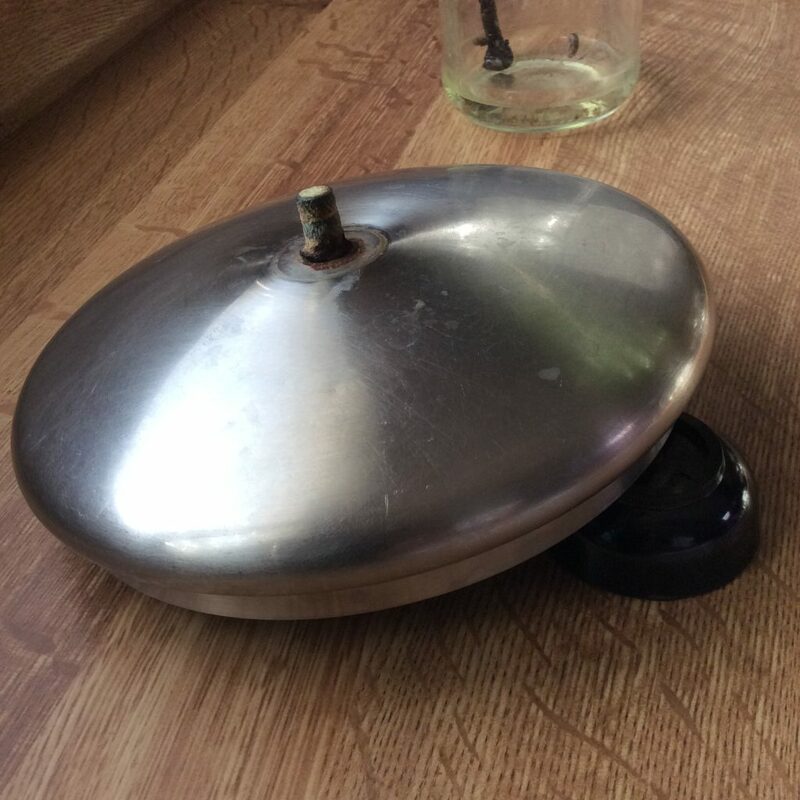 If replacement isn’t an option (you have one that we don’t make) you might try restoring them as described here, being sure to remove any Bakelite that looks damaged, to get to undamaged Bakelite. 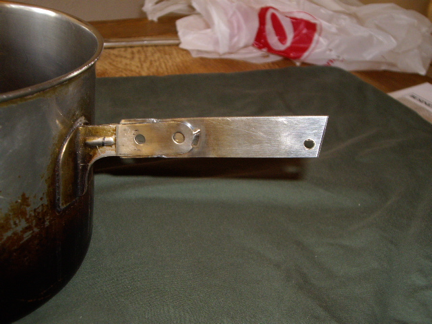 To to sure, Bakelite is known to be safe as it has been used on cookware, and many other products, for around 80 years. When used properly, there is no danger. But it does have the potential for misuse if it is used in the oven or on too high heat. It is better to be safe than sorry. 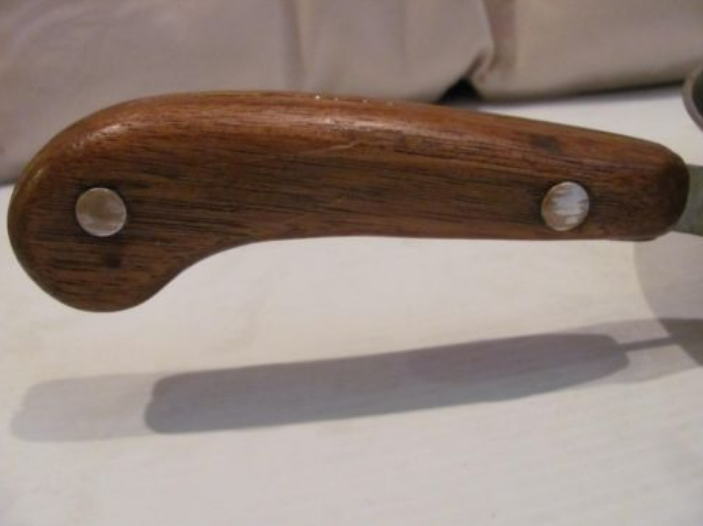 We sell quite a few replacement Bakelite handles and what now now, but there are some parts that don’t have enough demand for us to produce, given the minimum quantity we must order for each part we make. Assuming it isn’t cracked, restoring an old, faded Bakelite part is the only option. There used to be a restoration service (that was expensive) that was an option before we started producing parts, that involved sanding the Bakelite with progressively finer sandpapers. But we just came across a guide that makes it sound much more simple. Wipe down the handle with warm soapy water to wash away as much of the grime as possible. Rinse with warm water and dry with a clean cloth. Buff away deep scratches gently with fine gauge sandpaper. 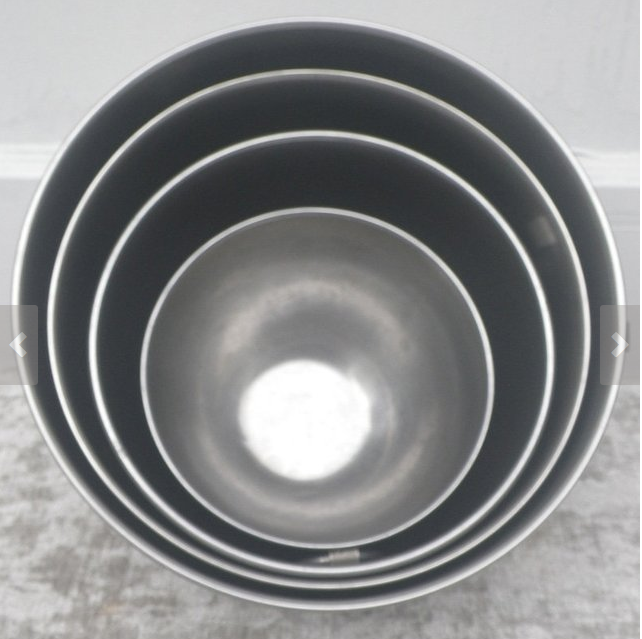 Apply liquid metal polish in a tight circular motion with a clean cloth. Rub with as much pressure as needed to polish away the accumulation of stains and dirt. Wait for the polish to haze over. Rub with a clean, dry cloth to remove the polish. In terms of what fine gauge sandpaper is required, I am guessing perhaps 200, 400, or 600 grit would be possible options. Colored Revere Ware Bakelite parts come up for sale on eBay occasionally, and often sell for ridiculous prices (like this). 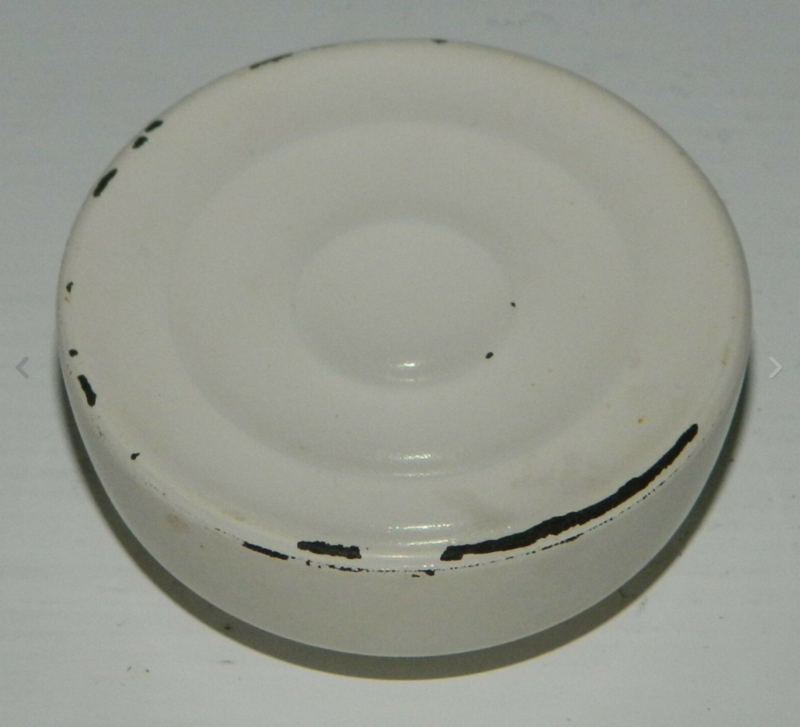 But a slew of colored knob listings recently, has me wondering if all the colored Bakelite parts are just painted. All these recent listings appear to be. Bakelite can be made to be just about any color, and perhaps these knobs are simply ones that were painted by the owner and not the company. 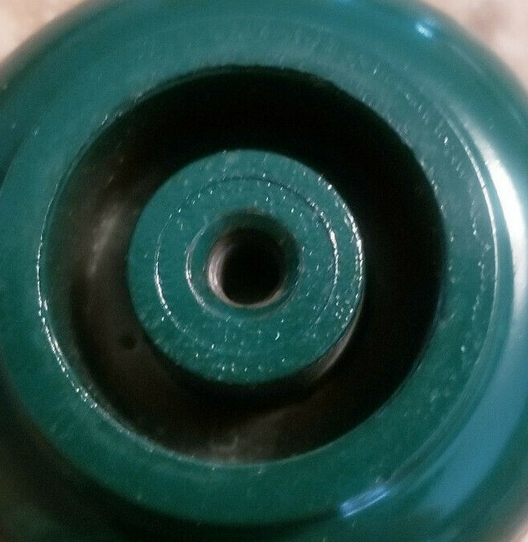 We’ve been asked from time to time if we would produce a series of colored Bakelite parts, but that is a difficult proposition, as there is typically a minimum order quantity of any color we would have to run that is in the thousands; there isn’t likely to be _that_ much demand for colored parts. Given what we are seeing above, your best bet might be to just get a can of high temperature paint and paint them yourself. 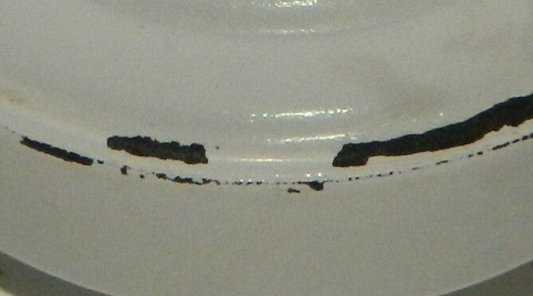 So you think YOUR Bakelite is in rough shape? 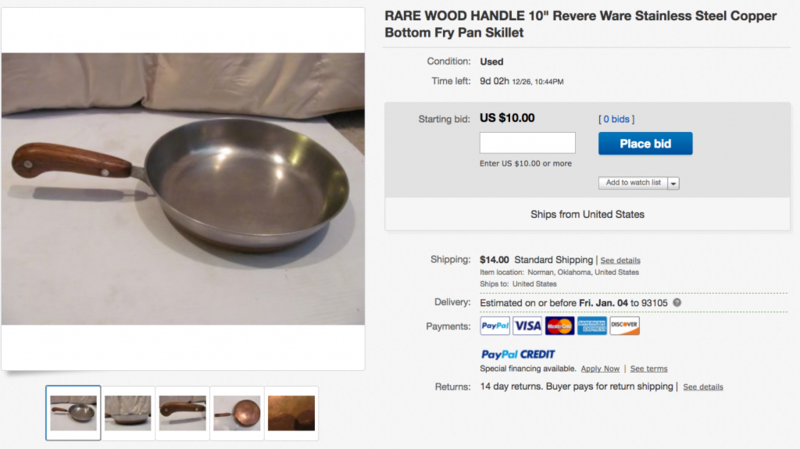 I sometimes get a chuckle out of seeing poor shape of people’s beloved Revere Ware, that they simply refuse to let go of. I’ve heard a few stories of the lid without a knob that is used with a pair of pliers kept nearby. 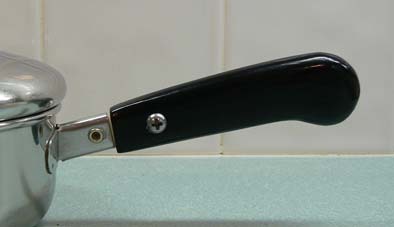 We often get pictures of really damaged Bakelite handles that people have been using that way for years. 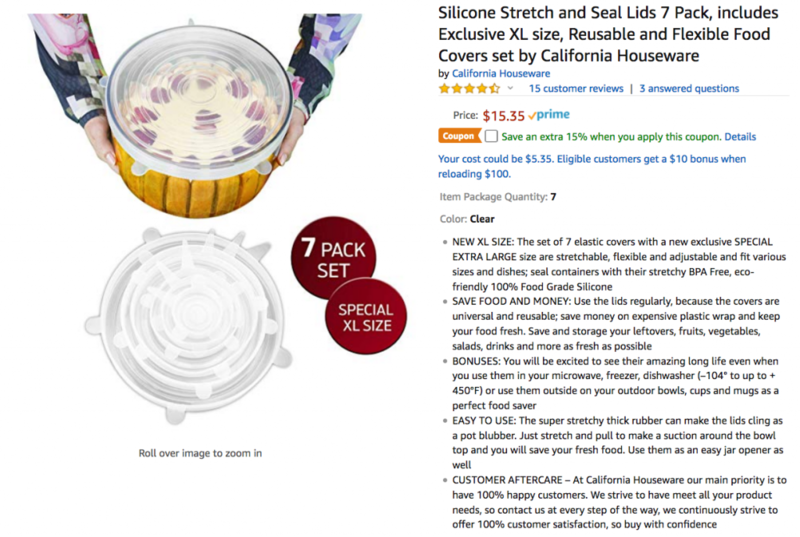 It’s not surprising that people soldier on using damaged cookware thinking they won’t be able to find replacement parts. While we’ve been selling them now for ten years, before we came on the scene, there was a good 30 years where parts were not available. 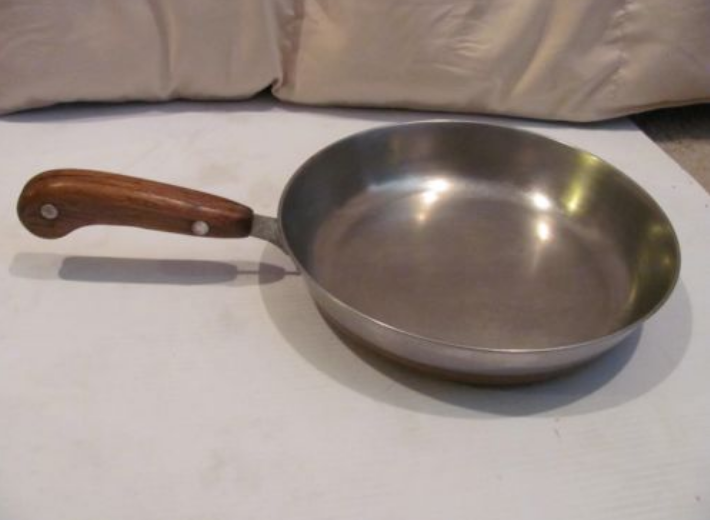 Today’s winner in that department is Alex, who sent us these pictures of his skillet. I can only imagine how long they have been held together that way. Sadly, that is the early style handle for which we don’t have a direct replacement, although our replacement handles can be used with those for a somewhat imperfect fit. Because our replacement cap & trigger don’t work on all Revere Ware tea kettle models, we’ve created this handy guide to help identify which model / capacity tea kettle you have. We’ve written about this before, but as it is the most common question we receive, it is worth mentioning again. Over the years, Revere Ware had many different types of lid knob screw inserts (the part that provides the threads inside the lid knob). 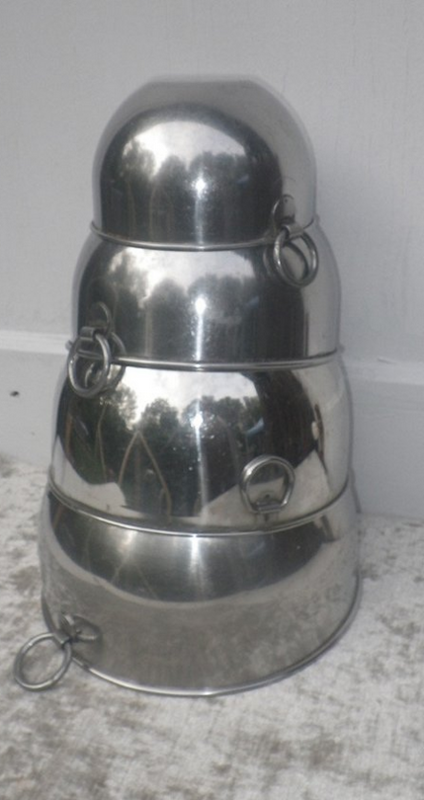 We’ve seen brass, aluminum, stainless steel, and threads directly in the Bakelite (the worst, as they strip easily). 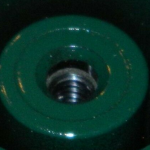 It is fairly common for the screw insert to rust to the screw on the lid. Rust is common whenever you have dissimilar metals touching each other. 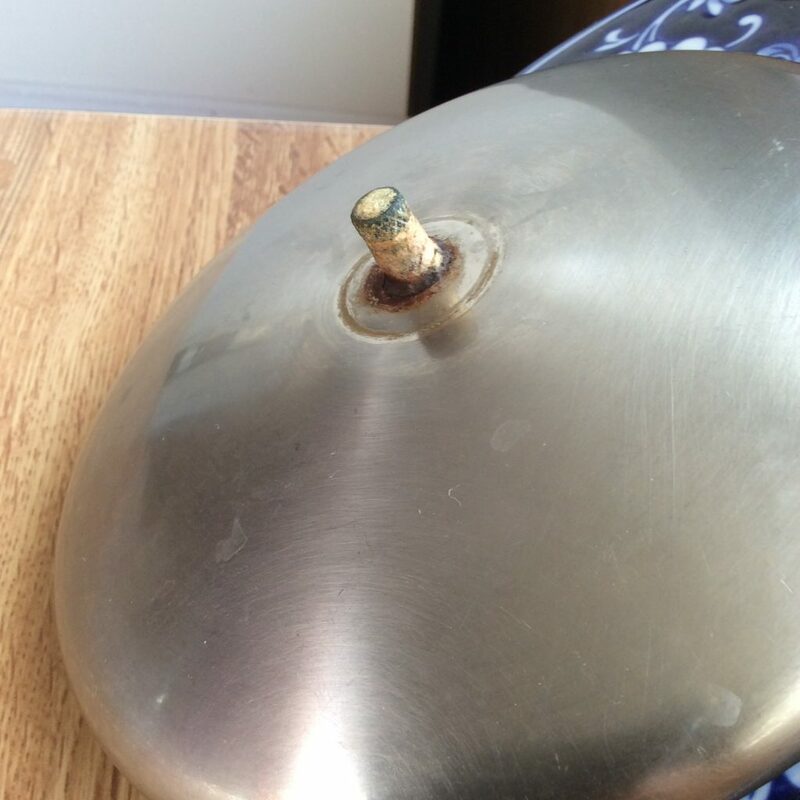 Customer Evelyn send us some great pictures of her lid that has this problem. It makes it look like it requires a press-on knob, not a screw on one. Evelyn soaked it with oil overnight, and then used a pair of pliers to unscrew it the next day. It came off and she was able to use the replacement knob she ordered from us.